Question: When you watch a game of baseball, what do you drink? Answer: Beer, of course. Question: But what goes in your other hand, the spare one? Answer: Select from: A) a baseball glove, B) a large sponge finger, C) a cow bell if you are from Tampa, D) a white towel if you are a Phillies fan, E) a sign declaring your love for either, Evan Longoria or Ryan Howard, F) another beer, G) a hot dog. Last night, being thousands of miles from the ball park (although there in spirit), I had option G.
It seemed completely inappropriate to go through the World Series without at least one hot dog. So I had three. Fluffy-chewy white rolls, meaty-thick sausages, sweet fried onions and a zig-zagging of mustard and ketchup; the image of fast food America. What could be better then beer, hot dogs and a game of baseball. Game 4. Beer 4. Old Scratch Amber Ale (5.3%) Flying Dog Ales (website - you really should check this out). The second Flying Dog beer this week, and another winner from the 2008 Great American Beer Festival earlier this month - silver in the Amber Lager category. Flying Dog are a pretty cool brewery from Colorado, with links to Hunter S. Thompson and Ralph Steadman, who is responsible for the iconic labels. Their range is awesome. 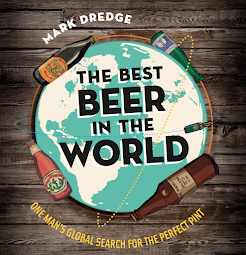 Traditional brews (IPA, golden ale); a showcase of ‘old’ styles (porters, a biere de gardes and a barley wine); and some ‘extreme’ choices which challenge our conception of what ‘beer’ is, or can be (Double IPAs, and their Wild Dogs – 750ml bottled beasts). There may not be another brewery which so encapsulates the essence of the American craft beer scene right now. The Old Scratch pours a deep amber with a creamy froth: it’s one good looking beer. The aroma is nutty-caramel-sweet with flowery hops. The malt comes with just-burnt caramel and toasted bread, then the crisp, but mild, hops cleanse the palate with dry citrus and grapefruit. It’s smooth, well balanced and easy drinking; a great example of an amber lager, which should be richer and gutsier in the malt department than its lighter amber-less friend. And I’ll tell you something, it’s bloody good with hot dogs. In fact, I’d go as far as saying that it’s the perfect beer to drink while eating a hot dog.